Before: The floor covered in boxes of outdated informational documents. The top shelf lined with box files. 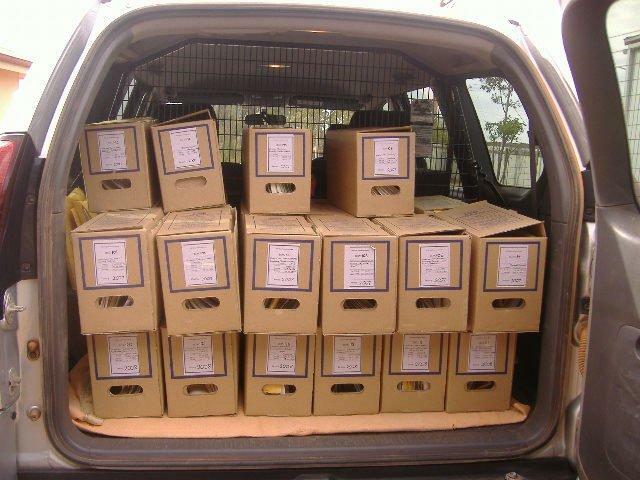 In 2007, I accepted an opportunity to gain invaluable experience in records management by undertaking to prepare the non-current records of a small New South Wales Public Office for disposal. 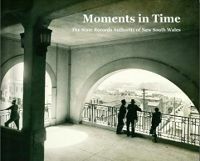 At the time I was a student enrolled at Charles Sturt University in the Bachelor of Arts Library and Information Science course (I expect to finish this year and have since transferred to the Bachelor of Information Studies – Records & Archives specialisation), and had completed the University of New South Wales short course Managing Historical Documents. 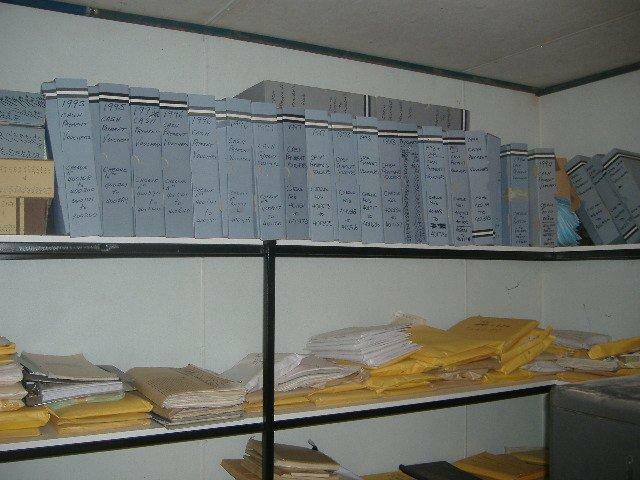 I had never worked in the public sector and had almost no practical experience in records and archives. Although I went into the project knowing that the task would be huge and a steep learning curve, I was also a little ignorant, not realising that no records had ever been registered, classified or even named according to any documented convention or consistent system. This was an aspect I hadn’t even considered; I had expected that files would be systematically titled at least, and that I would just pick up a file, and enter the data for registration, classification and sentencing. What a learning curve! 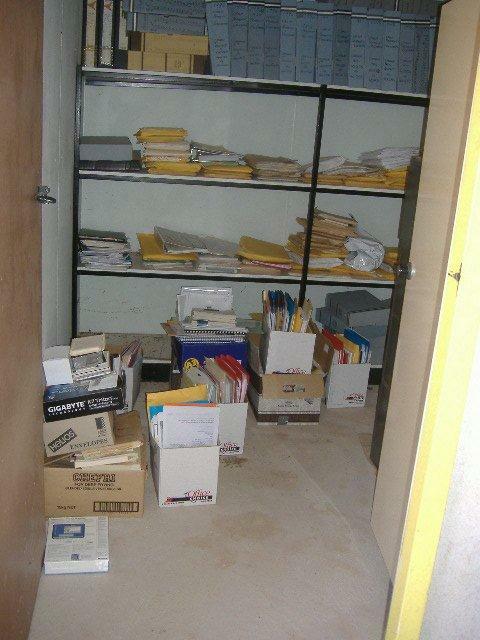 Before: Unprocessed file boxes lined the top shelf. Every new project has an impetus. 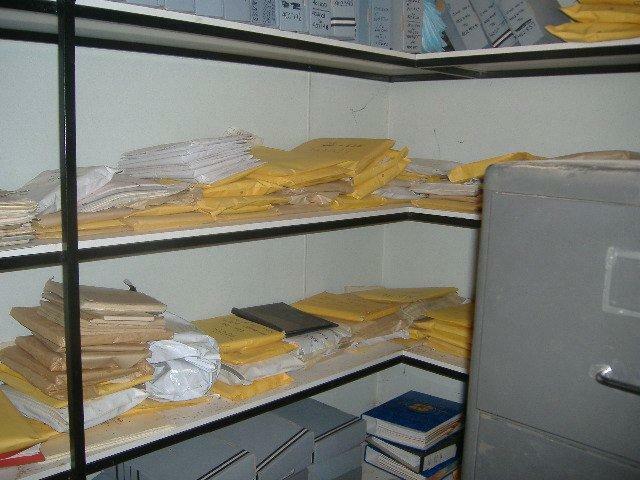 This one had two; firstly the Public Office had wanted to ‘clean out’ the records room (a small room in the corner of a shed) for some time, but understood that disposal had to be authorised in accordance with the State Records Act 1998, and secondly in response to the requirement that every NSW Government agency have in place a comprehensive functional retention and disposal authority for core records by 2009/2010. This presented a rather daunting task for a very small Public Office, with only one employee responsible for administrative tasks, unable to allocate time for the retrospective records management of fifty years worth of non-current records. The Public Office decided to employ someone to undertake the project of developing a functional retention and disposal authority, preparing all non-current records for disposal and completing disposal actions. Where to begin was the first and most difficult question to answer, so we attended a Developing a Functional Retention and Disposal Authority workshop conducted by Recordkeeping Innovation at State Records, The Rocks. This certainly gave us some insight into the size and complexity of the task ahead, however, we (the Public office administration employee also attended) remained quite overwhelmed by the task and still didn’t have a clear idea of the next step. The workshop informed us of what must be done, but not how to actually go about achieving the outcomes and completing the process for our particular context. Armed with the knowledge gained from the workshop and a copy of Procedures for Disposal Authorisation it was time to do some planning and make a start. Before: Rusted file cabinet occupied the centre of the room. The most valuable lesson learnt from this project was to ask questions, repeatedly until you get an answer that makes sense, and to seek and accept assistance from those with experience from the highest level you can. Instead of asking “do we really have to do all this?” we should have been asking “who can help us with this?”, however asking the wrong question repeatedly did lead to the right answer. In this case, invaluable assistance came from Nicola Forbes, Manager, Corporate Records Information Services, Land and Property Management Authority, our overarching department and from State Records NSW. These contacts proved invaluable, providing support and advice on every aspect and process throughout the project. 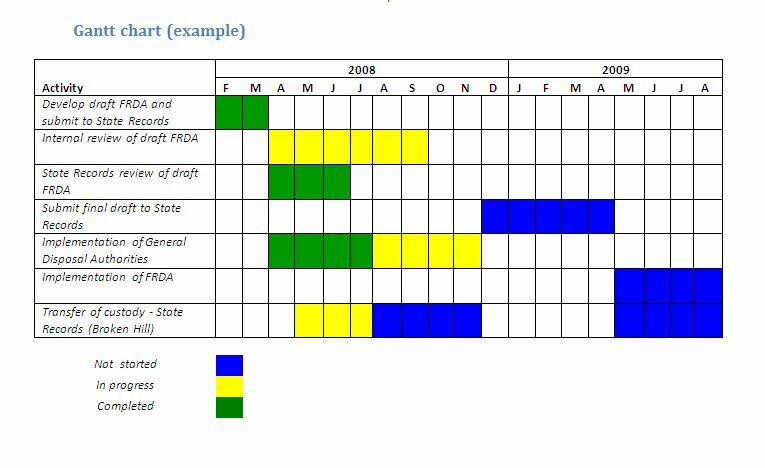 A Gantt chart was created to provide a timeline for the various stages of the project and keep management informed of progress. A project diary was maintained to document the processes and record notes from which reports to management and procedural manuals could be compiled. Regular reports to management including updated and revised Gantt charts, kept everyone informed of progress and ensured continued support for the project from the highest level. Ordering boxes – organising the chaos required appropriate containers, type 1 boxes were recommended for standard paper records. An employee responsible for records destruction must oversee the shredding to satisfy themselves that all records have been properly and completely destroyed. Find out what can be shredded, for the process we used, all plastic had to be removed, including glossy pages – worms can’t digest plastic – and large metal fasteners. Staples and small metal paperclips could be left on but not plastic coated paperclips. Records approved for destruction, loaded for a trip to the shredder. Stay tuned for Part 2: The real work begins………..